ON THIS PAGE: Product Description theOMNISPHERE Solution Looks! Most high end speakers are well engineered, use top quality components and provide substantially flat on-axis frequency response. Some are nearly flawless in this respect. But what about the full range of off axis response? No manufacturer of conventional or omnidirectional speakers we know of has the courage to provide this data . Wolcott Audio does . And it is important because what you hear in a normal room vitally depends on total speaker output. At Wolcott Audio we understand that the character of room reverberant sound is a result of total speaker output. Not just front radiation, but what's coming off the top. sides and back of the speaker enclosure as well. Unfortunately the frequency response of the off-axis sound in most conventional box speakers is uniformly terrible. A number of authorities have concluded that producing an accurate illusion of the original musical performance requires a flat power response vs. frequency. This means that the total acoustic output is the same at all frequencies. Wolcott Audio achieves both flat on axis and flat total power response at the same time through a unique omniradiant sound propagation system . it's called the OMNISPHERE. Only the Wolcott Audio OMNISPHERE reproduces the same frequency response throughout the full 360 degrees horizontal axis and 120 degrees vertical axis. It's the closest you can come to pure sound. The recent proliferation of omnidirectional or shaped response systems from a number of major manufacturers attempt what Wolcott Audio accomplishes in the OMNISPHERE. The critical difference is the "how" of achieving omnidirectional characteristics. The theoretically perfect but practically unachievable speaker concept is a pulsating sphere. The speaker systems presently being offered by others, almost invariably use multiple arrays, clustered or aimed in different directions in an attempt to achieve omnidirectional response. The OMNISPHERE by Wolcott Audio, is, indeed, different. It uses the concept of a single point source of sound with a spherical dispersing surface. This patented approach is the closest achievable to the theoretical pulsating sphere. The sound waves from the tweeter flow uniformly. with zero diffraction. along the surfaces of the spherical disperser while bass and midrange tones spread upward and outward in the same way. The result is incredibly pure sound. By eliminating multiple arrays the OMNISPHERE eliminates the unavoidable defect of individual drivers located at differing distances from the listener. Since sound travels at finite speed. a single transient input to a multiple array speaker system results in multiple acoustic arrival times at the ear. This smears mid and high frequency sound detail, and in the case of longer duration tones causes irregular frequency response. This varies additionally with listener position. causing lobing or "picket fence" response. The shortcomings of conventional multiple arrays become apparent when individual speakers are more than a fraction of a wavelength apart, and are severe at a half wavelength or greater. This. for example. requires that there be less than 0.32 inches difference in distance from the radiating center of each tweeter to the ear in order to limit severe effects to 20 KHZ and above. It Doesn't Look Like A Speaker! Form follows function. And the OMNISPHERE looks the way it does for good reason. 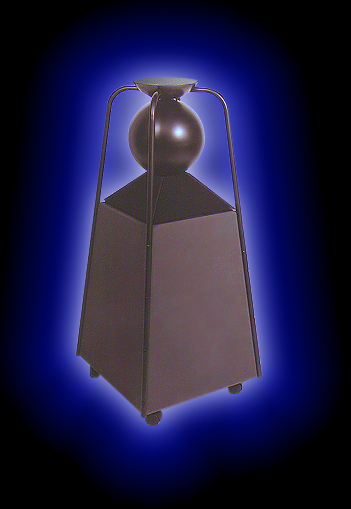 The construction of the OMNISPHERE HF point source radiator is achieved by driving the space between two opposing spheres with the tweeter dome. The result is omnidirectional radiation of a uniform OMNISPHERE's bass and midrange driver configuration includes four 61/2" cast basket vented drivers with inverted butyl surround and polypropylene cones. providing uniform response through 2 kHZ. Ultra-rigid pyramidal speaker mounting with internal stiffening separations provide the necessary close spacing and a non resonant baffle board for superb uncolored midrange. Whether your musical preference is classical. rock and roll. jazz. or anything else in between. the OMNISPHERE offers incredible sound reproduction . in any environment We could talk about the OMNISPHERE forever, but the only way to appreciate its engineering excellence is to listen to this incomparable Wolcott Audio achievement with your own ears. Contact your local audio specialist for a demonstration today The Wolcott Audio OMNISPHERE. It's the new shape of pure sound and coherent expanding sound field. The improved air loading of the OMNISPHERE also quadruples tweeter power handling providing unprecedented acoustic output from a single unit.